In 1916, Lord Baden-Powell set up Wolf Cubs for the younger brothers of the Scouts who were desperate to join in the fun. Wolf Cubs are based around ‘Rudyard Kipling’s Jungle Book’. Where a young boy brought up by a Wolf pack has to learn to develop to be a self sufficient man. Leaders take their names from the Jungle Book story. Wolf Cubs continue to this day for the 8-10 age group. The ‘Pack’ meets weekly usually for one and half or two hours. Packs tend to have a number of Sixes distinguished from each other by colour patches on their upper left sleeve. Sixes are made up of; in the main; six wolf cubs with one (called a Sixer) responsible for his/her Six ensuring the younger and less experienced Wolf Cubs are looked after during the Pack activities. Team Games are played to develop knowledge about Scouting in a creative way – all by having fun. 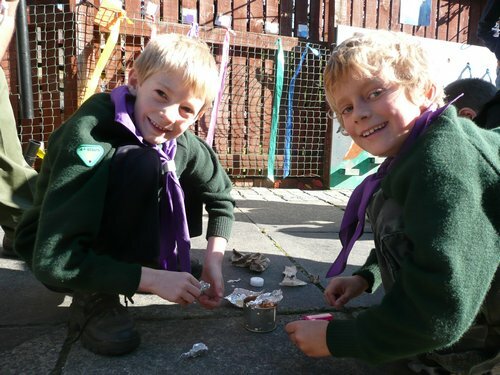 The Wolf Cubs programme is developed so that in the two years as being part of the Pack the Wolf Cub will achieve his/her 1st and 2nd Stars which will see him/her learn about the Country Code, their countries flag, the Saints – even how to cook breakfast and polish a pair of school shoes. There are many badges to achieve in Wolf Cubs. Some will be planned into the meetings activities and some can be done at home or may well be achieved if they have other interests. Out and about exploring their local surroundings and learning about their local community is also part of the program. They will learn and understand in more depth about their local public and community services and often get hands on demonstrations from those professionals who take time out to tell them about their roles in the community. Usually Wolf Cub Camp is the first experience any young person gets of camping (without Mum or Dad) with friends. They learn how to look after themselves (personal hygiene) and their belongings and help each other. Camp activities are well planned and supervised by the leaders to ensure the Wolf Cups are kept busy, active, happy and having bags of fun!! As a Wolf Cub progresses through their 3-4 years in the section, they start to experience camping under canvas & take part in activities & events that give them a taste of what scouting will be like when they finally move up. To find out more about what we do, check out the Wolf Cub Programme!